Finding content for your business blog on a regular basis that is interesting, useful and entertaining can be difficult. You may find yourself running out of ideas or struggling to think of what to write. Luckily, there are several tools on the internet that can help you. With these 10 tools you’re sure to be able to find refreshing new topics to write about that are also SEO friendly. With the free Google Adwords tool you can discover how many people are searching for your keywords, as well as what other keywords are being searched for, on Google and incorporate them into your business blog posts. Followerwonk can help you generate content ideas as well as find out the key influencers in your niche and find out in-depth knowledge about your Twitter followers. The tool offers you Twitter analytics in the form of useful graphs which can easily be shared too. Question and answer site Quora can help you to write business blog posts that answer your readers’ specific questions. By finding out what questions are frequently asked, you can provide content which is highly useful to your readers. Useful tool Soovle lets you enter a keyword or keyword phrase and generates other keyword suggestions from up to 15 external websites. You can choose which sites are included and save searches. 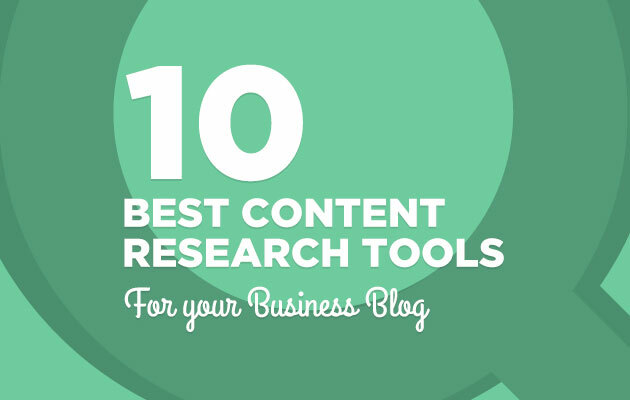 This tool makes it easy to research across different platforms quickly and choose suitable content for your blog. Facebook Page Insights lets you know what kind of content is performing well by showing you the activity on your Facebook page. It can also show when is best to post your content to the social media site. Google Suggest is Google’s auto-complete, predictive function that appears when you type something into the search bar. This can help you quickly find related search queries and keywords in your niche, giving you a starting point for relevant content. Google Webmaster Tools is an absolute essential for your business blog, including when it comes to generating excellent content. This free tool can show you which keywords and phrases are helping your site appear in the search engine results pages (SERPs). It can also show you exactly which words and phrases people are using to search for content, giving you ideas for useful blog posts. Übersuggest is a free keyword suggestion tool which allows users to type in a keyword and offers them a large selection of related keywords on which great content could be based. You can use Ubersuggest to brainstorm ideas related to your search terms. Topix.com is an excellent way to find content ideas. All users have to do is enter their keyword and the search function produces useful results relating to your keyword including articles, blog posts, forums and other websites. By browsing these you are likely to discover some interesting new content to write about. Discussions on LinkedIn are a great way to discover new ideas and content. There are several industry groups you can join which often contain intelligent and useful discussions from thought leaders and experts. By reading these you can discover frequently asked questions, trends in the market, events and opinions which can help you generate new content. If you need any help writing high quality content for your business blog, please get in touch today.